Postural control during quiet stance is a common everyday physical activity. Sleepiness is increasingly prevalent in our 24-h society. Yet, little research exists that quantitatively links the fluctuations in sleepiness and postural control. We have quantified the circadian amplitude and homeostatic buildup rate in postural control. With a force plate we assessed postural control in 12 participants (21–38 years) every 2 h during 24 h of sustained wakefulness. The sway area was 1.39 ± 0.71 mm2 at the circadian high around noon, and 4.02 ± 0.67 mm2 at the circadian low around 6 am (a 189% change, p = 0.02). The circadian amplitude of the sway area was therefore 2.63 mm2 (Fig. 1, left panel). The sway area was 1.92 ± 0.64 mm2 at the start of the 24-h period and 4.42 ± 0.69 mm2 at the end of the period (a 130% change, p < 0.001). The homeostatic buildup rate of sway area was 0.04 h-1 (Fig. 1, right panel). This shows that that the circadian amplitude and homeostatic buildup rate are quantifiable from posturographic data, and that they have significant impact on postural control. This finding is important because it means that one could apply the framework of the famous two-process model of sleep regulation (published by Borbély in 1982) to explain the previously reported sleepiness-related changes in postural control. This again means that one could use the two-process model to predict postural control. This has implications for elderly people with poor postural control as well as for professions were slips, trips, and falls are work-safety concerns. Fig. 1. Sway area as a function of time of day (left panel) and as a function of time awake (right panel), during the 24-hour sustained wakefulness (N=12 subjects). Right panel shows that sway area is largest at 06:00 (i.e., postural control is poorest, marking sleepy) and smallest at 12:00 (i.e., marking alert). Right panel shows that sway area increases with time awake (i.e., that sleepiness impairs postural control). Anesthetics impair postural steadiness leading to increased risk of falls. 103 patients stood quietly on a portable and inexpensive Nintendo® Wii Fit balance board before and after an endoscopic procedure that included sedation with midazolam. A nonlinear sway measure, Fuzzy Sample Entropy (FSE), was used to quantify the regularity of the sway signal recorded by the balance board. FSE decreased in 92/103 patients, from 0.22±0.04 to 0.16±0.04 (p<0.001). Fig 1. 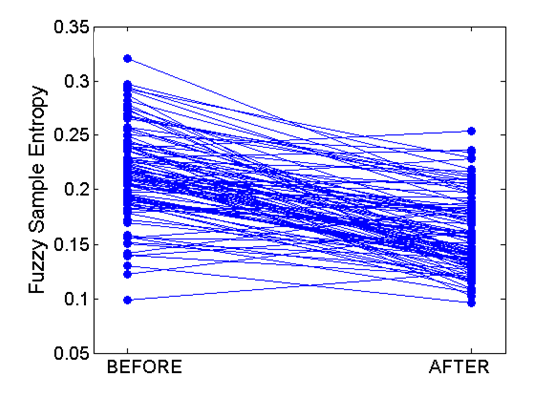 Fuzzy Sample Entropy before and after sedation. Anyone of us can get hurt for no reason because we encounter someone excessively tired . We therefore try to develop a high-tech portable sleepiness tester for the common good. We are enrolling subjects for sleepiness self-test. Please read more from here. Sleepiness causes even 20% of all traffic accidents  . Still, 60% of all adult drivers drive though feeling drowsy  . Except hazarding traffic, sleepiness also causes even 50% of all occupational accidents  : either on roadways, in air, in hospitals, or in the industry. In Finland sleepiness costs nearly 1 billion Euros a year. In the US there is already legislation criminalizing driving while tired, “Maggie’s Law”  . In Finland we clearly need to do something to address this issue. An “alcotester” for sleepiness solves this issue. One understands the hazards of sleepiness from an analogy with drunken driving: driving after 17 h of waking equals driving with 0.05% blood alcohol concentration (BAC)  . Most industrialized countries legislate against driving and working with 0.05% BAC. Therefore it would be logical to set a 17 h waking limit, if the time awake (TA) only could be measured quantitatively. There are ongoing regulatory  and legislative  efforts to minimize the public health and safety hazards of sleepiness. The challenge is to easily and quantitatively test sleepiness. Unfortunately, contrary to breath-testing for alcohol intoxication there is no simple analogous quantitative sleepiness test  . Posturography provides a candidate. Our group is developing posturography for quantitative sleepiness testing [9-11] . The rationale: posturographic results are quantitative because balance is a physiological variable, unlinked to the subject’s cognition. We have shown that TA is posturographically measurable (Fig. 1) -with 69% positive predictive value in 20 subjects  , and with 86% accuracy and 97% precision in 12 new subjects  . These results prove the concept, our idea works (Fig. 2). We have also shown that balance impairs significantly already in 5 h à we can tell if a subject is sleepier than when the daytime sleepiness peaks (Fig. 3). Fig. 1. Posturographic sleepiness testing. Testing is easy and fast . Left pane shows a posturographic measurement -a portable force platform samples body center-of-pressure excursions balance- for 30 s. Quantitative results in 10 s . Right pane shows a reference curve (blue) for making TA estimates (red). Create the reference curve by recording balance every 2 h during extended wakefulness. Make the TA estimate by superimposing the test score (here 1.11) onto the reference curve -read the TA (here 4 h) from the wakefulness-axis. We can estimate the TA within ± 2.5 h corresponding to a BAC accuracy of 0.01% 10 . Fig. 2 . 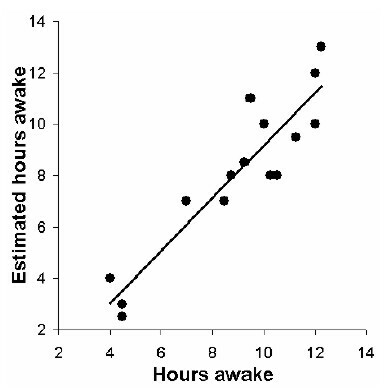 Estimated time awake plotted against the subjects’ true time awake (results from 20 subjects in Forsman et al 2007 9 ). Fig. 3 . Left pane: balance from 8:30 hours to 13:30 hours. The balance impairment is significant and balance recorded at 13:30 hours serves as a reference value to detect excessive sleepiness awake (results from 30 subjects in Forsman et al 2007  ).which is sketched in the right pane. 1 G. Maycock, Journal of sleep research 5 (4), 229 (1996); J. A. Horne and L. A. Reyner, BMJ (Clinical research ed 310 (6979), 565 (1995); K Dobbie, 2002. 3 D. Leger, Sleep 17 (1), 84 (1994). 4 L. Seugnet, J. Boero, L. Gottschalk et al., Proceedings of the National Academy of Sciences of the United States of America 103 (52), 19913 (2006). 5 D. Dawson and K. Reid, Nature 388 (6639), 235 (1997); N. Lamond and D. Dawson, Journal of sleep research 8 (4), 255 (1999). 6 D. Dawson and K. McCulloch, Sleep medicine reviews 9 (5), 365 (2005). 7 C. B. Jones, J. Dorrian, and S. M. Rajaratnam, Industrial health 43 (1), 63 (2005). 8 C. Guilleminault and S. N. Brooks, Brain 124 (Pt 8), 1482 (2001). 9 P. Forsman, A. Wallin, A. Tietavainen et al., Journal of sleep research 16 (3), 259 (2007). 10 E. Haeggstrom, P. Forsman, A. Wallin et al., IEEE transactions on bio-medical engineering 53 (8), 1578 (2006). 11 P. Forsman, E. Haeggstrom, A. Wallin et al., Journal of occupational and environmental medicine / American College of Occupational and Environmental Medicine 49 (6), 591 (2007). 12 P. Forsman, A. Tietäväinen, A. Wallin et al., (Submitted).